This site (shodo.jp) presents the Japanese calligraphic arts (shodo) by our shodo master Ms. Masayo Tokuda. There are two main services. One is to present and provide pre-designed kanji T-shirts. All designs are avaiable from our shop in zazzle.com for US consterms. This page presents our featured and recommended products. Another one is to write your prefered kanji characters, such as your name. You can place a request to us and our artist will select and write kanji characters for you. You will get them in .jpg and/or .png files. If you want to have original writing on paper, handling and shipping charges will be applied. Ms. Masayo Tokuda, our shodo (Japanese calligraphy) master was born in 1959 in Ichinomiya City in central Japan. She still lives in her born place. She started to learn calligraphy when she was a five-year old girl. Since then, she has practicing shodo and won several prizes in Japan. 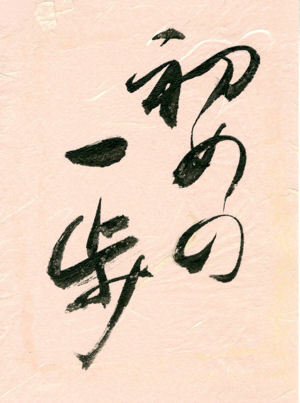 Shodo is an art to express one's thoughts, emotions and messages in the form of characters and words. It is important to select the best combination of pen, paper, ink, style, etc. to reflect what is to be expressed. It is a fun to get what I'd like to get. 18.What is Calligrapher in Japan?